Dust is one of the particulate matters which consists of particles of size ranging from 1 to 200µm. These are formed by the disintegration of rocks or by some mechanical processes such as spraying and grinding. The combustion of fossil fuels and their products in industries is responsible for the emission of dust particles. In addition to the burning of fossil fuels, major industries like paper and pulp, fertilizers, textiles, steel and cement contribute large amount of dust particles to the atmosphere. Since most of these industries are located in major cities, these significantly add to the pollution burden of the metropolitan areas. Control methods: The most effective means of dealing with dust particles emission problem is to prevent the formation of dust or control their emission at the source itself. In the case of dust emission in industries, this can often be achieved by investigating various approaches at an early stage of process design and development, and selecting those methods which do not contribute to dust emission. Control of dust emission at the source can be accomplished in several ways through operational changes, raw material changes, modification or replacement of process equipment and by more effective operation of existing equipment. These changes are called “source correction methods”. 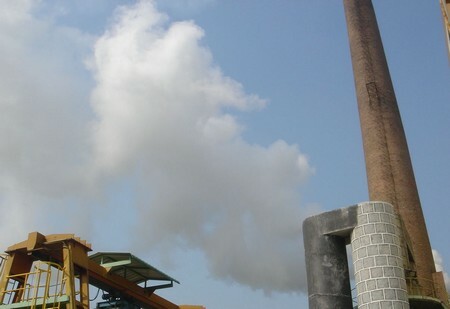 When the source correction methods cannot achieve the desired goal of dust emission control, “effluent gas cleaning techniques” can be used. These techniques involve many of the chemical engineering unit operations, and at present form the main part of dust control technique. Raw material changes: If a particular raw material is responsible for causing dust emission, use of a purer grade raw material is often beneficial and it may reduce the formation of dust and undesirable impurities. A typical example of this approach is the use of low-sulphur fuel in place of high-sulphur ones. Process changes: Process changes involving new techniques offer important ways of lowering dust emissions. For example, rotary kilns are the major source of dust generation in cement industries. Some degree of dust can be controlled in kiln operation by adjusting operating conditions. Reduction of the gas velocities within the kiln and employment of a dense curtain of light weight chain at the discharge end of the kiln can lead to dust control. Perfect maintenance: Dust emissions from industrial operations can be reduced by proper equipment maintenance, housekeeping and cleanliness in the premises. Some of the unit operation equipments to collect industrial dust are cyclone separators, electrostatic precipitators, fabric filters, wet collectors and gravity settling chambers. These are the equipments used in controlling dust emissions at industrial installations ranging from power plants, cement industries, paper mills and oil refineries.